MTB routes in the Pla de l'Estany region. 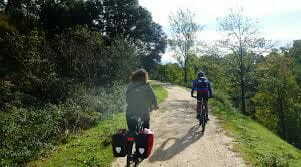 Trainings and guided bicycle routes. Route to Girona, passing through Banyoles. Route that connects the house with the Banyoles BTT Center (Pla de Martis), departure point of several MTB Routes of Banyoles. Circular route Besalú - Maià de Montcal - Crespià - Esponellà - Serinyà - Fares - Besalú (35 km. ).